Colorado National Monument protects 32 square miles of wilderness near Grand Junction, Colorado. Monument Canyon is the reason for this area’s preservation, running north to south through the park and housing sandstone formations that have inspired names like Window Rock, Praying Hands, and Kissing Couple. The canyon’s most notable feature is Independence Monument, a 450-foot spire at the heart of Monument Canyon. “The Monument” has one campground and numerous hiking trails. Rim Rock Drive is the main road through the park. The scenic drive features several well-positioned viewpoints. Temperatures in the park range from below freezing in the winter to mid-nineties in July. Colorado National Monument has an entrance fee. The foremost advocate for the protection of this land was John Otto, a man who moved to Grand Junction at the turn of the last century. He fell so in love with the area’s picturesque geology that he dedicated his life to its preservation. Through his efforts, Colorado National Monument was formed in May of 1911. That same summer, John Otto began a tradition that has remained to this day. On the fourth of July, he climbed to the top of Independence Monument and planted the American Flag. This tradition has been renewed each year for the last hundred years. In 1911, John Otto became the first park custodian for Colorado National Monument. He held the position for thirty years, working for $1 per month. John Otto constructed and maintained many of the trails that serve the park today. 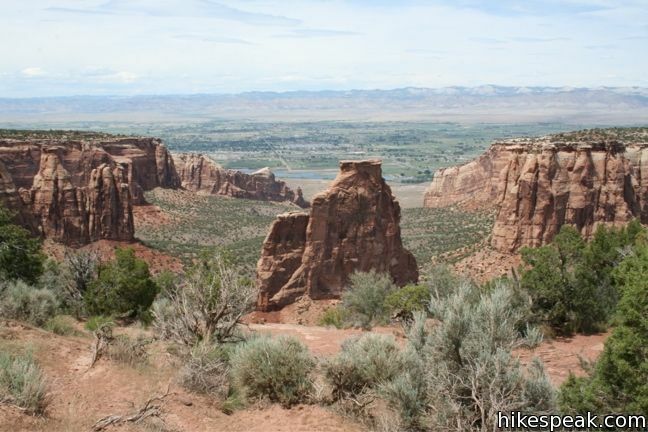 This collection of trails in Colorado National Monument lists the hikes from north to south. The table may also be sorted alphabetically or by distance to help you pick your next adventure. Each trail links to its own report complete with photos, maps, directions, and all the other information needed to locate and enjoy these hikes. Below the table is ann interactive map with the location of each trail. Devils Kitchen Trail is located near the south end of Colorado National Monument at the bottom of rugged No Thoroughfare Canyon. This 1.2-mile hike ascends 225 feet to visits an intriguing rock formation on the side of the canyon where tall boulders have enclosed a rock grotto. No Thoroughfare Canyon Two junctions are along the way and the path gets faint toward the end, so follow the... Read more. Monument Canyon Trail is six miles long in one direction, dropping from Rim Rock Drive across Monument Canyon to a second trailhead on the eastern edge of the park. Three and a half miles (and 850 vertical feet) from the top, the trail passes Independence Monument, the largest freestanding rock formation in the park. A popular hike along Monument Canyon Trail is a 7-mile out and back from... Read more.